The NACM National Membership is designed to reward and assist national companies, with decentralized operations and holding memberships with multiple NACM Affiliated Associations, with reduced membership pricing and single invoice management and reporting. Companies eligible to apply must currently hold memberships with 5 Affiliates or more and enroll at least 10 member representatives. The NACM National Membership is based on a "per representative" model, featuring a flat, per representative fee of $225. The membership dues invoice and representative changes will be managed by NACM; NACM will communicate representative changes with the Affiliates. 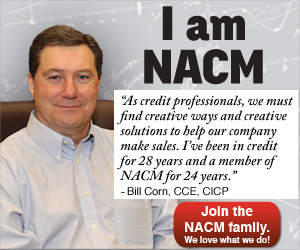 Are you an individual looking to join NACM? The NACM National Membership works on an annual fee basis; once paid, no refunds can be made although substitutions for representatives may be made throughout the year. The NACM National Membership fee covers only Affiliate and National membership dues; dues for industry credit group membership are additional and must be coordinated and purchased by the member representative and the Affiliate group sponsor. In order for a representative to be eligible to join an Affiliate industry credit group, the representative must be a "named" National Member representative. Registration fees to attend local Affiliate and National seminars, conferences, networking events, classes, etc. are also additional. National Members will supply a list of all credit department personnel. The A/R data contribution will support the NACM National Trade Credit Report and will be coordinated by NACM-Tampa. NACM National Members send A/R files to one place at least every 30 days. NACM Tampa will share the data out to all of the National Trade Credit Report Affiliates. NACM National Members may be eligible for a national credit report contract, negotiated by NACM Tampa and benefiting all NACM NTCR Affiliates. The A/R data contribution will be coordinated with NACM-Tampa. NACM National Members send A/R files to one place at least every 30 days. NACM Tampa will share the data with all of the National Trade Credit Report Affiliates. Submit a complete roster of credit team personnel, indicating which staffers will be named as NACM National Member representatives. The roster will include names, titles, mailing and email addresses, and phone numbers. Get started today! NACM National Membership holders may take 20% off FCIB full, affiliated or global membership dues. NACM is pleased to offer 1 complimentary registration for every 10 paid to NACM National Members. NACM National Members may take a 10% discount off of any NACM National in-house certificate session. NACM National Members may take 10% off the cost of any NACM Credit Learning Center module or certificate course. The potential savings ranges from $6.99 of one module to $54.90 off the cost of a course. NACM National Members may take 20% off the annual tuition for NACM's Graduate School of Credit & Financial Management. The potential savings is $1,250 off each registration, each year. NACM National Members may take 10% off of CCE recertification fees. NACM National Members may take a 10% discount off select NACM Secured Transaction Services which include NACM-produced (internal, not attorney facilitated) Notices to Owner; Blanket UCC-1 Filings; Purchase Money Security Interest and UCC-1 Filings. Lien Navigator: 10% discount on the annual subscription. NACM-Produced Notices to Owner: 10% discount per notice. Blanket UCC-1 Filing: 10% discount per filing. Purchase Money Security Interest UCC-1 Filing: 10% discount per filing. Each member of the NACM National Member's credit team will be offered a personal subscription to Business Credit magazine. Each team member can elect to receive their own print copy by replying to an invitation that will be sent via email. Each member of the NACM National Member's credit team will receive a personal subscription to eNews, delivered electronically each Thursday. Contact me to discuss whether my company qualifies for this membership. and enroll at least 10 member representatives.